The CanWork Research Network was established in May 2011. 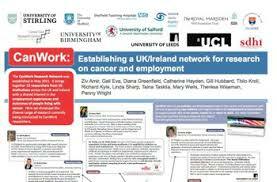 It brings together researchers from academic and health-related institutions across the UK and Ireland with a shared interest in the employment experiences and outcomes of people living with cancer. Its members currently include: Ziv Amir, Gail Eva, Diana Greenfield, Catherine Hayden, Gill Hubbard, Thilo Kroll, Richard Kyle, Fehmidah Munir, Sara MacLennan, Sarah Scott, Linda Sharp, Taina Taskila, Mary Wells, Theresa Wiseman and Penny Wright. I am also a member. CanWork exists to co-ordinate and drive forward research into cancer and employment with the aim of generating new evidence and insight to inform the development of interventions to support people with cancer access, remain in, or return to work. For more information about the CanWork Research Network visit: http://canceremploymentresearch.wordpress.com. This entry was posted in Uncategorized and tagged Cancer, Cancer survivorship, CANWORK, Employment, Gill Hubbard, Mary Wells, Return to work, Richard Kyle, Sara MacLennan, Taina Taskila, Ziv Amir. Bookmark the permalink.